Historically, bronchogenic carcinoma was the term used to describe the origin of some types of lung cancer—namely those that arise in the bronchi (the largest airways of the lungs) and bronchioles. Now, this term is used interchangeably with lung cancer of all types. While the name bronchogenic carcinoma may sometimes be used in the old way—referring to lung cancers arising in the central airways instead of the periphery of the lungs—it is most often used to describe any type or subtype of lung cancer. Symptoms may include a persistent cough, coughing up blood, or repeated lung infections, with a chest CT scan and biopsy being the most common way in which it is diagnosed. Treatment options have expanded considerably in recent years, and now include surgery, radiation therapy, chemotherapy, targeted therapy, and immunotherapy. While bronchogenic carcinoma is clearly associated with smoking, its important to note that there are a number of potential causes, including radon, air pollution, and more, and at the current time, the majority of people who develop these cancers are non-smokers (either never smokers or former smokers). 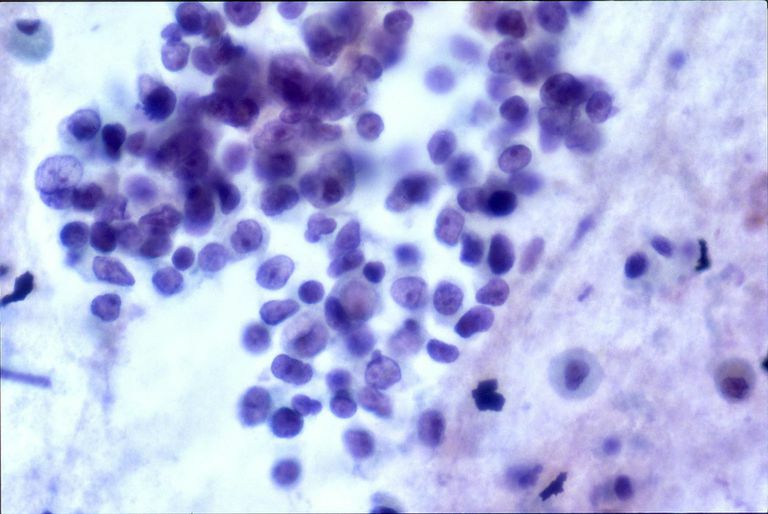 Small Cell Lung Cancer: Small cell lung cancer is named for the appearance of the cells under a microscope (small cells.) This type of cancer is present in approximately 15 percent of people with lung cancer. Non-Small Cell Lung Cancer: Non-small cell lung cancer accounts for most bronchogenic carcinomas (around 80 percent) and is further broken down into lung adenocarcinoma, squamous cell carcinoma of the lungs, and large cell lung cancer. Bronchogenic carcinoma (lung cancer) was once considered rare. In a book published in 1912 titled Primary Malignant Growths of hte Lungs and Bronchi, the author was only able to verify 374 published cases of the disease. In 2018, lung cancer is the leading cancer-related cause of death of both men and women in the United States. At present, the most common form of lung cancer is lung adenocarcinoma. It's thought that part of this change may be related to the addition of filters to cigarettes. Instead of cancers such as squamous cell lung cancer and small cell lung cancer which usually arise in the large airways of the lungs, lung adenocarcinoma often arises in the distant airways in the periphery of the lungs. It's felt that the addition of filters allows toxic chemicals in cigarette smoke to be drawn further down into the lungs. Of course, lung cancer occurs in never smokers as well as people who smoke, and adenocarcinoma is the most common form of lung cancer in never smokers. Radon exposure in the home: Radon is the second leading cause of lung cancer in people who smoke, and the number one cause of lung cancer in non-smokers. The diagnosis of bronchogenic carcinoma may be made in several ways. Sometimes a physician finds an abnormality on a chest x-ray prompting further evaluation with a chest CT scan or other imaging method. A PET scan may be done, as this is the most sensitive way of finding the spread of lung cancer and accurately staging the disease. This is important, as while surgery is the treatment of choice for early-stage lung cancer, it would not be recommended for people with metastatic lung cancer. When an abnormality is found on an imaging study, physicians often recommend a lung biopsy of some form to confirm the diagnosis, as well as to learn about the molecular profile of the lung cancer (genetic testing). This is extremely important as newer treatments for some subtypes of lung cancer have become available. If you have non-small cell lung cancer, especially lung adenocarcinoma or squamous cell carcinoma, talk to your talk about possible gene mutations in your tumor. Though a lung biopsy is still the gold standard for doing this testing, in 2016 a blood test called a liquid biopsy was approved for testing for some of these mutations. PD-L1 testing, and now tumor mutation burden testing, are tests that can sometimes estimate who will best respond to the immunotherapy drugs now available for lung cancer. Low-dose CT screening is now available for bronchogenic carcinoma, in people who meet certain criteria. It's been found that for people between the ages of 55 and 80, who have a 30 pack-year history of smoking, and either smoke or quit in the past 15 years, screening may decrease the mortality rate from lung cancer by 20 percent. If you meet these criteria, or if you have other risk factors for lung cancer, talk to your doctor about screening. The treatments your doctor recommends will depend on several factors, including the type and stage of lung cancer you are diagnosed with. It is important to learn about your diagnosis, as studies suggest that people who are actively involved in their lung cancer care have better outcomes. Treatments may include lung cancer surgery, chemotherapy, targeted therapies, radiation therapy, and immunotherapy. Sadly, the prognosis of bronchogenic carcinoma remains poor, with the 5-year survival rate just a little over 18 percent. Prognosis varies based on the type and stage of lung cancer, with survival rates being much better when diagnosed in the earlier stages of the disease. Though these statistics are sobering, advances in the treatment of lung cancer are improving the survival, even for people with metastatic (stage 4) disease. Many people are working together in an attempt to reduce the stigma of lung cancer being a "smoker's disease." Not only do never smokers and people who quit long ago develop lung cancer, but regardless of smoking history, every patient with lung cancer deserves love, compassion, and the best medical care available. Check on lung cancer support groups either in your community or online. Educate yourself about your disease and new advances that may pertain to you. If your loved one has been diagnosed with lung cancer, check out these tips on supporting a loved one with cancer, and coping when your loved one has lung cancer. Bronchogenic carcinoma has gone from a relatively rare disease to the leading cause of cancer-related deaths worldwide in the last century. Certainly, smoking has been responsible for a significant portion of these cancers, but research is needed to look for other causes. Why? Though the overall incidence of lung cancer has been decreasing in recent years, it has increased significantly for young women who have never smoked. On a positive note, after many years of limited improvement in the survival rate for this disease, life expectancy is now improving. Targeted therapies are now allowing many people to control their disease for many months or years with oral medications. Immunotherapy drugs have sometimes resulted in a "durable response" such that some physicians believe it may be possible to cure some advanced lung cancers. Hopefully, reducing the stigma of bronchogenic carcinoma as a smoker's disease will lead to greater funding and better treatments in the future. National Cancer Institute. Non-Small Cell Lung Cancer Treatment (PDQ) - Health Professional Version. Updated 08/31/18. Spiro, S., and G. Silvestri. 100 Years of Lung Cancer. American Journal of Respiratory and Critical Care Medicine. 2005. 172(5):523-9. National Cancer Institute. Small Cell Lung Cancer Treatment (PDQ) - Health Professional Version. Updated 07/19/18. How Are Pancoast Tumors Different From Other Lung Cancers?